Textured brushes can also have a dual tip. A dual tip is a secondary tip that can be blended into your primary tip in various blend modes, with its own full set of tip settings. In the Brush Properties dialog, click on the Dual Tip tab. Check the check box in the Dual Tip tab to enable the Dual Tip functionality. Multiply will draw the least opaque pixel of either brush tip, making more spaced out, inconsistent strokes. Color Dodge will add the opacity of the pixels in both brush tips, making more opaque strokes. 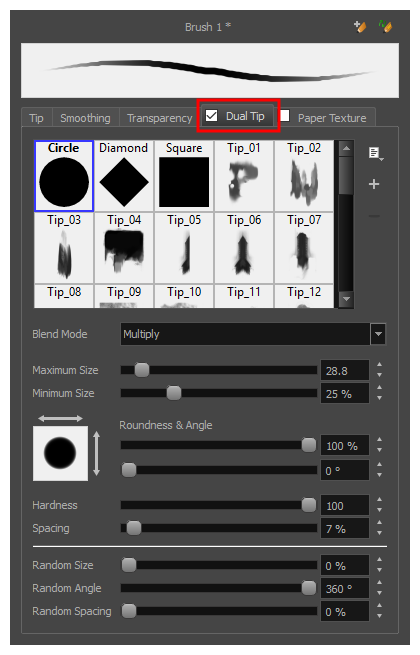 Combine will draw the most opaque pixel of either brush tip, combining the tip shapes without increasing their opacity.